Feed-a-Gene aims to better adapt different components of monogastric livestock production systems (i.e., pigs, poultry and rabbits) to improve the overall efficiency and to reduce the environmental impact. This involves the development of new and alternative feed resources and feed technologies, the identification and selection of robust animals that are better adapted to fluctuating conditions, and the development of feeding techniques that allow optimizing the potential of the feed and the animal. Feed-a-Gene has been awarded a grant from the European Commission (Grant agreement no: 633531) under the EU Framework Programme for Research and Innovation Horizon 2020. The estimated eligible costs of the action are € 9,933,795.00. The duration of the action will be 60 months as of 1st March 2015. Develop new and alternative feeds and feed technologies to make better use of local feed resources, green biomass and by-products of the food and biofuel industry. Develop methods for the real-time characterization of the nutritional value of feeds to better use and adapt diets to animal requirements. Develop new traits of feed efficiency and robustness allowing identification of individual variability to select animals that are more adapted to changes in feed and environmental conditions. Develop biological models of livestock functioning to better understand and predict nutrient and energy utilization of animals along their productive trajectory. Develop new management systems for precision feeding and precision farming combining data and knowledge from the feed, the animal, and the environment using innovative monitoring systems, feeders, and decision support tools. Evaluate the overall sustainability of new management systems developed by the project. 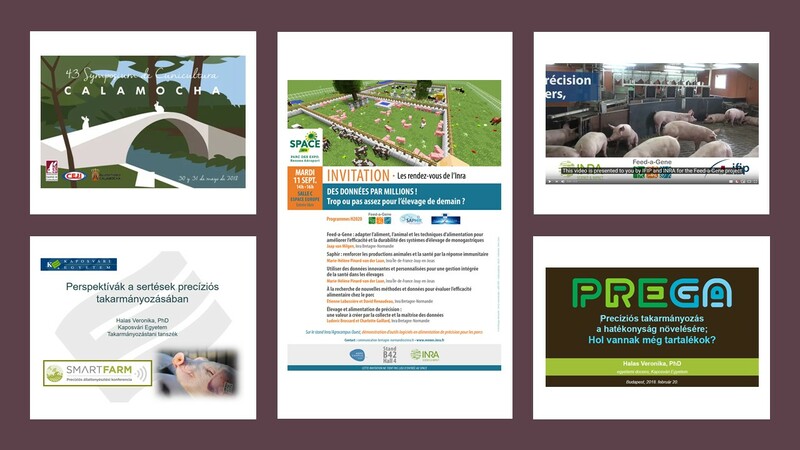 Demonstrate the innovative technologies developed by the project in collaboration with partners from the feed industry, breeding companies, equipment manufacturers, and farmers’ organisations to promote the practical implementation of project results. Disseminate new technologies that will increase animal production efficiency, whilst maintaining product quality and animal welfare and enhance EU food security to relevant stakeholders. 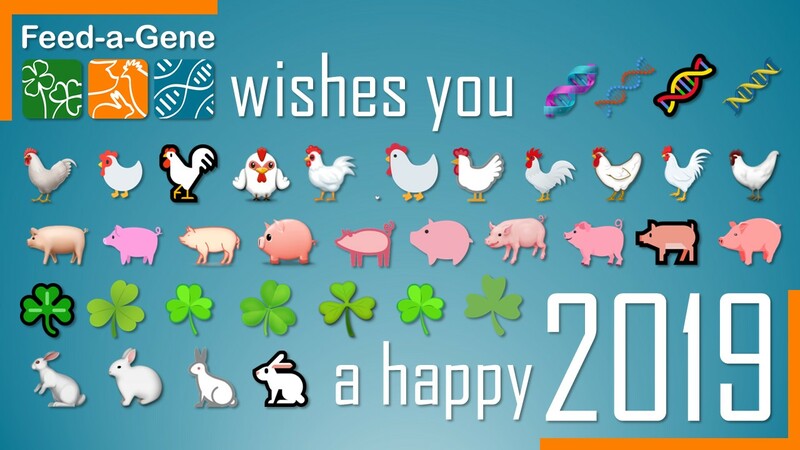 A Happy, Healthy and Prosperous New Year to all Feed-a-Gene partners and stakeholders! The Executive Committee of the Feed-a-Gene project has written a short note expressing its views and opinions of on what it feels are important topics to be addressed in the next framework program (FP9) Horizon Europe. Click here to download the note Suggestions for Horizons Europe (in PDF format). 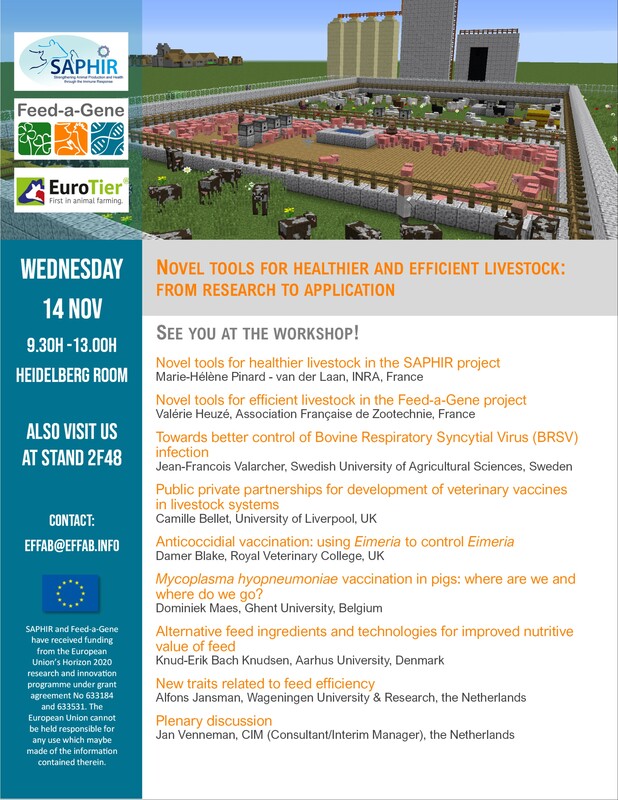 Next week, in Hanover, in partnership with SAPHIR, Feed-a-Gene will participate for the first time to EuroTier, the leading international tradefair for animal farming. Feed-a-Gene researchers put emphasis on technical information this year. Articles have been published in various national or regional publications, presentations have been done during fairs and technical days throughout Europe since the beginning of 2018. Feed-a-Gene gathers 23 partners from 8 European countries and China: 8 research institutes and higher education organisations, 9 industry partners (2 involved in livestock production, 2 in innovative technologies for animal breeding, 3 in feed production and transformation, and 2 in equipment for precision feeding), 6 in extension and management. Do want to take part in Feed-a-Gene? Register on the Stakeholder Platform!